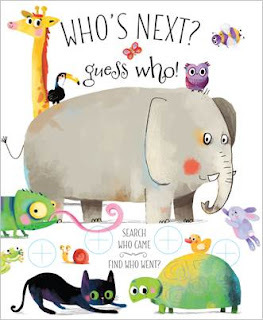 Kids' Book Review: Review: Who's Next? Guess Who! Review: Who's Next? Guess Who! First came the elephant with his friend, the lovely ladybird. But who came next? And who left? Who’s Next? Guess Who! is a gorgeous interactive picture book for toddlers complete with over 30 cute and quirky creatures of all shapes and sizes, who come and go. Encouraging littlies to pay close attention and look carefully as they interact with each page, Who’s Next? Guess Who! asks the questions - who came and who left? This fun guessing game allows young children to use their analytical skills of concentration, thinking and observation as they provide the correct answers. A very clever book with a full page of animals in the back (and looking out for who leaves when crocodile comes along), Who’s Next? Guess Who! is the perfect picture book for little hands and young minds. A delightful publication that will amuse and entertain over and over again. Title: Who’s Next? Guess Who!